The concept of faith is difficult to understand. Yet, Christians claim to ‘believe’ and ‘have faith’. So it is important for all Christians to know what faith is and how it comes about. Faith, according to scripture, is a gift of God. That faith is a gift of God is taught in Scripture. Note the following two texts. Ephesians 2:8: “For by grace you have been saved through faith. And this is not your own doing; it is the gift of God.” Regardless of whether “this” and “it” refer to “faith” or to “you-have-been-saved-by-faith”, faith is here presented as a gift of God. Philippians 1:29: “For it has been granted to you that for the sake of Christ you should not only believe in him…” The fact that “to believe” has been “granted” indicates it is a gift. That faith is a gift of God will be agreed to by any Bible-believing Christian. But how is it a gift? On that, convictions differ. To explain that I’ll use the analogy of Jim giving Jenny chocolate. 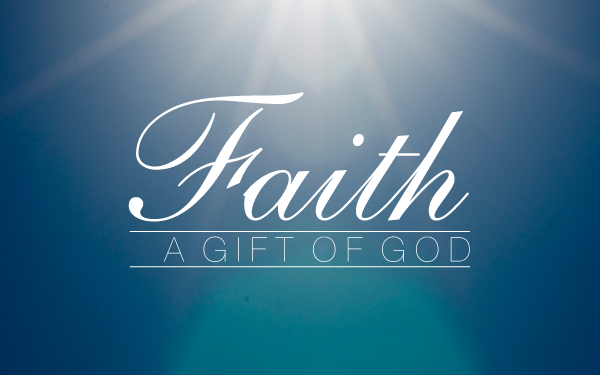 Some claim that faith is a gift in that God “presents” faith to a person. A person will then have to choose by his own (free) will whether or not to believe. This is like Jim holding out the chocolates and looking for Jenny to accept them. The problem is: after the fall into sin man’s will is not free but totally corrupt. It only chooses evil. And man’s actions are only evil. Jenny will never accept the chocolates. She does not want to. She never will as she cannot. She loathes chocolate. And she loathes Jim. A variant on this view notes that God also has to empower a person to believe. Jim has to endear himself to Jenny. And he has to get her to like chocolate. But still: man’s will is not free. Even if Jim gets Jenny to like him and to like chocolate, she will never accept the chocolates. She will never want to. The will needs renewal. The Reformed confess that God “confers” faith on man. Jim actually deposits the chocolate in Jenny’s lap. If she doesn’t want the chocolate, she’d have to give it back. Can man give faith back to God? God even “infuses” faith into man. Jim actually makes Jenny chew the chocolate and swallow it. Give it back? Impossible. Indeed, God’s faith-giving-grace is “invincible” (the ‘I’ of TULIP). Everything that needs correction in man to have him believe is accomplished by God. The mind is enlightened. The heart is opened. The will is renewed. Faith is given. And then man believes. Yes, man himself believes. God does not believe for man.